President Obama’s nine options for picking the next Supreme Court justice. 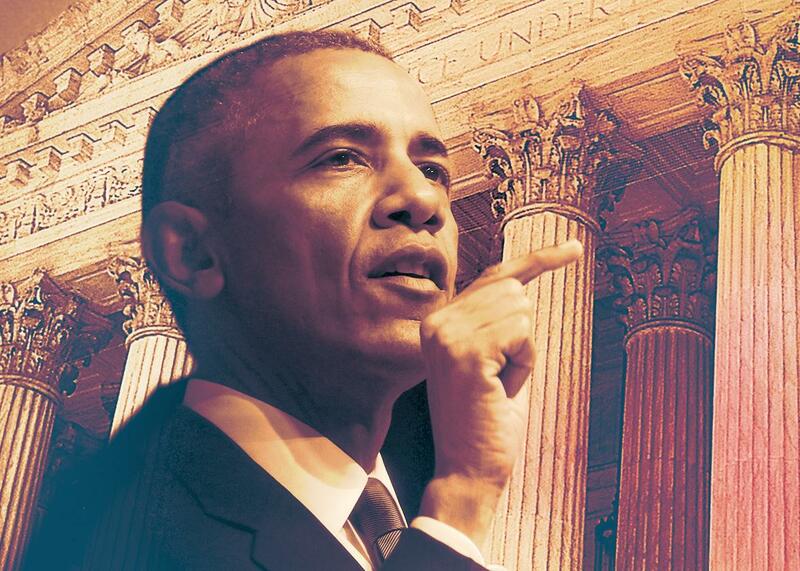 How should President Obama play his Supreme Court hand? Nine options. Photo illustration by Lisa Larson-Walker. Photos by Jonathan Ernst/Reuters, iStock/Thinkstock. Justice Antonin Scalia is dead, and President Obama has a problem. Republican senators are refusing to confirm or even consider anyone Obama nominates to replace Scalia. They say that Obama has less than a year remaining in office, and therefore this lifetime appointment should be left to the next president. How should Obama respond? Here’s a look at his options. 1. Most qualified. This is the simplest approach: Nominate someone who’s so clearly fit for the job that senators can’t justify standing in the way. Merrick Garland, the chief judge of the D.C. Circuit Court of Appeals, has the bench experience: 19 years on the appeals court and three as chief judge. Patricia Ann Millett, another judge on the D.C. Circuit, has the litigation experience: 32 cases argued before the Supreme Court. But the best way to squeeze Republican senators is to put forward a nominee they’ve already voted to confirm. By that standard, the best candidates are D.C. Circuit Judge Sri Srinivasan (confirmed 97–0 in 2013), 8th Circuit Judge Jane Kelly (confirmed 96–0 in 2013), and 9th Circuit Judge Jacqueline Nguyen (confirmed 91–3 in 2012). Senators would have to explain why, having already approved these judges, they now refuse to grant them a hearing. 2. Least partisan. If Obama wants to play nice, he could offer Republicans a relatively palatable nominee. Srinivasan clerked for conservative judges, worked in George W. Bush’s Justice Department, and has endorsements from two former Republican solicitors general, Ken Starr and Paul Clement. Garland has a judicial record of siding with police. Other potential nominees—U.S. Attorney General Loretta Lynch and 9th Circuit Judge Paul Watford—have prosecutorial experience to offset their work for liberal causes. But if Obama picks a moderate nominee, and the Senate says no, it would be that much harder for Obama’s Democratic successor to sell Republicans a more liberal nominee next year. 3. Best connected. Think of Supreme Court confirmation as lobbying: The smart move is to buy off key players, offering them a candidate they know and like. In this case, Kelly is a good choice: She has an extremely influential fan in Chuck Grassley, the Republican chairman of the Senate Judiciary Committee. Alternatively, Obama could nominate someone who’s already a member of the Senate, such as Sheldon Whitehouse of Rhode Island (a former U.S. attorney and state attorney general), Cory Booker of New Jersey (a Yale Law School graduate), or Amy Klobuchar of Minnesota (a former county prosecutor who now sits on the Judiciary Committee). 4. Most potent minority. If Republicans are going to stonewall Obama’s nominee, the least he can do is make them pay for it in the election. And the best way to do that is to nominate someone who represents a big constituency that will take offense at the stonewalling. Obama has several options: black men (Watford and D.C. Circuit Judge Robert Wilkins), white women (Millett and Kelly), and a black woman (Lynch). But the best group to target, given its size and its importance to Republicans, is Latinos. The Supreme Court has a Puerto Rican justice, Sonia Sotomayor. But this country has 33 million Mexican-Americans. Many of them might be excited by the first nomination of one of their own—say, Justice Mariano-Florentino Cuéllar of the California Supreme Court—and furious at Republicans who won’t give him a hearing. 5. Most neglected minority. Maybe Obama wants broader diversity, not just another black or Latino. In that case, he could choose someone who has a disability or represents a religious or sexual minority, such as Stanford Law professor Pam Karlan, who’s bisexual. But the biggest group that’s unrepresented on the court today is Asians. Candidates from this group include Nguyen (whose family comes from Vietnam) and California Supreme Court Justice Goodwin Liu (Taiwan). The boldest pick might be Srinivasan, who’s not just an ethnic minority (Indian-American) but also a Hindu. 6. Immigrant. The greatest long-term threat to the Republican Party is that by opposing comprehensive immigration reform and embracing Donald Trump, the GOP will brand itself as the anti-immigrant party. What better way to facilitate this suicide than to make Republicans stand in the way of the court’s first non-European immigrant? Srinivasan was born in India. Nguyen was born in Vietnam. Cuéllar was born in Mexico. Nominating a naturalized American is just the sort of thing that fits Obama’s style. And it sets up just the sort of fight Republicans don’t need. 7. Most liberal. If Obama wants an ideological war, he could nominate Karlan, who’s proudly progressive on incarceration, the death penalty, and reinterpreting the Constitution. He could pick Lynch, who has targeted racism in policing, or his former White House counsel, Kathryn Ruemmler, who led the legal battle to defend Obamacare. These candidates might mobilize the Democratic base. But they might mobilize the Republican base, too. And that kind of confrontation isn’t Obama’s style. 8. Youngest. Liu is 45. Cuéllar is 43. Leondra Kruger, another justice on the California Supreme Court, is just 39. That kind of youth is attractive when you’re looking for a nominee who could extend your legacy for decades. But when the Senate won’t confirm your pick, youth is irrelevant. You want a nominee who will help you in the political standoff, not on the court. 9. Wait and see. My money is on Srinivasan. He checks off every box. He’s moderate and eminently qualified. He has worked for conservative judges and a Republican president. He was unanimously confirmed to the D.C. Circuit. He would be the court’s first Asian and first non-European immigrant. If Republicans stonewall him, they’ll look really bad. But one other scenario intrigues me. Over the next month or two, the presidential primaries will shake out. If Hillary Clinton gains control on the Democratic side, and if Sen. Marco Rubio can’t do the same in the GOP, Republicans might find themselves staring at the possibility of a November wipeout. They could lose the White House and the Senate. Facing that prospect, they might decide that they’re better off cutting a deal with Obama than letting Clinton and the Democrats put a leftist on the court. In that case, Obama and the Republicans could strike a bargain. Or, if he’s had enough of bargains, Obama could tell the Republicans that he’s just a lame duck, and walk away.